About 2 months ago I started using a new facial cleanser: Jan Marini's Bioglycolic facial cleanser. I had been noticing that my skin was beginning to take on a dull look and I wanted to rev up my skin care regimen. Now that I've hit the quarter century mark, I want to start investing in my skin a little more. The noteable ingredient in this cleanser is Glycolic acid also known as "alpha hydroxy acid". I had heard of the benefits of AHA and was excited to try out a product that contained them. After doing a bit of research, I learned that AHA is derived from fruits and known as the "fruit acid". The most popular one to date comes from the sugar cane plant since it has the smallest molecules of all the AHAs. Glycolic acids are supposed to loosen the "glue like" attachments of skin conditions like acne, photodamage, and hyperpigmentation. It's also known to block free radicals. Personally, I have some remaining acne scars on my cheeks and temples that I've been working on. The bottom line is that Glycolic Acid has been proven to reduce scarring and improve the appearance of the skin. This is a non-foaming, medicinal scented cleanser that comes out in a white, liquidy form. I would recommend removing your makeup before hand with wipes, makeup remover, or cleansing oil beforehand as this will not remove all your makeup. I notice a bit of tingling as I massage it on my skin and neck. I try to avoid my lip area since it's very sensitive especially into these winter months. I use this twice a day, in the morning and before I go to bed. The smell definitely smells like something your dermatologist would prescribe, so if you're expecting berries and flowers, this isn't the kind of cleanser that offers it. After weeks of use, I notice that my skin does appear to be smoother and brighter. Even my boyfriend noticed. This is a gradual use product so don't expect results over night. Instead, use it as a part of your facial regimen to see long term results. My skin no longer has the dull tired look, instead it glows! A lot of celebrities are die hard Jan Marini skincare fans, no wonder their skin always looks so good! Leave a comment telling me your worst experience with a facial cleanser. I'll pick a winner and announce it tomorrow. 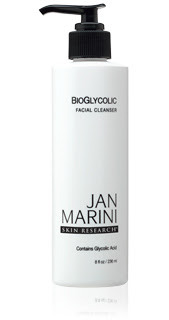 You'll receive a full sized Jan Marini Bioglycolic Facial Cleanser! i'm not sure if this is open to international but i'll comment anyways, worst experience is not only breaking out but my face turned really itchy and HOT all over for 1 week! My worst experience was when i was in high school. i had a breakout, and so i tried some mask i got as a gift. I put it on, and washed my face, then off to bed. i woke up and my face was BEET RED for 3 days. It was soo embarassing, and it was the 1st week of school. i tried covering it with makeup, but then i wasnt as makeup savvy and i looked ridiculous. i tired skipping school but i got cuaght, so i spent the next 3 days faking stomache issues to i could stay in the nurses office, knowing very well, my mom/dad wouldnt be able to come pick me up! Hey Renren. My worst skincare cleanser was with the Clinique 3-step skincare line. It was summer, about a week before my vacation and I wanted to get clearer skin, because I had a little acne. I tried this system before I went to bed. When I woke up, my face itched like crazy! I used it again, this time washing it with the soap a little more librally. As the day went on, my skin got red, and a little bumpy. And the next day, when I woke up(this time I hadn't used to system the night before)and my face was completely red with little bumps on it! It finally returned to normal in two weeks! My worst experience was when I tried proactiv (I do not recommend), that crap made my face all red and itchy! My husband felt sorry for me, that's how bad my face was lol. My worst experience with a cleanser had to be when I had a bad bout of acne and I tried a lemon soap. My god that stuff was so strong it left burns on my face. I am still trying to recover from the dark spot that I got from that.. My god. Sounds like a great product! I'm always on the hunt for a great cleanser so I thought it would be a good idea to try the Victoria's Secret line because the lady that worked there conned me into it. The same thing happened with Clinique's new Acne system.. Guess i should check the ingredients, huh? my worst experience was my fault, actually. i've always heard GOOD stuff about Proactiv. Well, my friend bought it but her skin was too sensitive and so she stopped using it! she had it for a few years. lol. so one day i asked her if i could use it and it was the worst decision ever. i'm not sure if my face was sensitive to it or if it was expired (being a few years old), because my face felt raw and was very sensitive. it was dry and was starting to peel! after that, i never used Proactiv again. never use anyone's stuff w/o doing research and always check the expiration date and shelf life of products. i would just tell people to use their own stuff because everyone's skin reacts different to certain products. it's just like medication - you wouldn't be giving your friends YOUR meds w/o making sure they can take it. it also wouldn't help to talk to a dermatologist before using something abrasive for your face. My worst facial product experience was when I first found out I was pregnant. I guess with the rush of hormones going through my body, I was sensitive to several products. I guess my skin was babylike.....IDK! But anyways, I used to always use Clean-n-Clear Morning something foaming cleaner...it had a rejuvenating effect. Well, I was like 3 months pregnant and was using this one morning , and as soon as it touched my face, it started to burn...I washed it off, and my face was extremely red and sore in some spots. I thought maybe it was just temporary, until I got dressed and looked in the mirror......the product had burned me. I had burns on my face for 2 1/2 weeks. I had to use Cocoa Butter on my face for the remaining of my pregnancy AND have a chemical peel afterwards. I still have some dark spots on my face! Yeah....I totally use the Johnson and Johnson Facial Cleanser for Sensitive Skin. It smells like baby shampoo and is eye safe, and it gets off makeup, dirt and grime EXCELLENT! I would love to try this product though! Pro-active's face wash RUINED my skin when I was younger. I fell victim to those infomercials & tried it out, and the next day I ended up looking like a tomato that was stung by 1,000 bee's (yes, it really was that bad). Of course I had to find out the hard way that I'm allergic to Benzoyl Peroxide! My worst experience was using the much hyped about Ly-Na cream. I had been using it every night for a week and one day not thinking about it, I didn't wash my face that morning and was sitting in the back yard with my hubby when all of a sudden i felt intense heat on my face. I went inside to check out my face and I had the worst sun burn you could imagine. On top of that , my face peeled for over a week. Not a pretty look. I am more careful now about washing my face in the morning after using that the night before. My worst experience with breaking out was when I had a big fat pimple right in the middle of my forehead that was really red. Even with concealer you could tell something was hiding underneath. I gave up on trying to cover it up and every time someone talked to me they would just stare at my forehead like they were talking to my pimple instead. My worst experience with a facial cleanser would be with one that totally stripped the natural oils from my face. I mean, totally! It made my face extremely dry that it felt tight and itchy. And when I say tight and itchy, I mean like... The kind of feeling you get when you shower and use the cheap kind of soap, like the hotel ones that leave your skin squeaky, no moisture at all. Yuck! It made my face break out (little tiny pimples) and I got red marks here and there that looked like rashes or like a sun burn and when I would put moisturizer on my face it stung! Never again!!! That stuff seems great! I visited the website and she has a great line of items! My worst skincare experience had to be trying Noxema!!! It seemed fine for the first week or so...I loved the way it made my skin tingle and I didn't feel totally dried out when I rinsed the cream from my face, but after about 2 weeks I had the most horrible systic breakout all over my chin, forehead, and nose. I had never had a breakout that bad EVER and I can honestly say that I think that caused alot of the skin problems I've had since then b/c my skin hasn't been the same. Now I use it as a learning experience.. "everythang AINT for everybody!!" I remember when I ran out of cleanser over one christmas three years back and I didnt have time to go out to buy any so I looked around and found this old one. My skin was really bad so i was desperate! It was like two years old but i opened it and it seemed ok. But when i used it it was runny and started to feel grainy on the skin. I was only young so I somehow had no common sense and I kept using it. The moment i patted my face dry it started to itch and i came out in red patches over night. luckily i was saved by some aloe vera gel and clean water cleansing over a couple of nights! i am all about keeping my face clean, glowing and flawless. i am also about trying new things. i was reading reviwes on the product called Acne Free. Its suppose to be better then Proctive and alot of people that tried it out even said that. so why not try it, right? that was a mistake!! the first few days fine then it just went down hill from there. my face started to burn and get extreamly dry. even my husband said my face look disgusting and i should just throw away the product, which i did. i guess there was one benifit from using that product and to find something that would help my face heal faster. i found Lush and wow it works wonder for my face! ever since then i've been on Lush but that does not mean i not going to try out new things just because a product failed. Currently, I have not been lucky with my pregnant to have that "glow" that they talk about. Instead my acne prone skin has remained acne prone, and at times even more oily and shiny! So anyways I tend to wash my face in the shower in the morning to save time, and I notice I had some minor breakouts on my chest. Well I decided to use my Avalon Organic facewash (got it at Target) on my face, neck, and chest. BAD idea. It looked like you could play connect the dot from my face down to my chest, and I got more breakouts on my chest after doing that. It's horrible. I tend to pull out my mirror at work at look at those ugly things :( I can not wait until they go away! I used one of those disposable facial cloths one time and went to bed that night, only to wake up to about 15 red bumps all over my face. I screamed lol! Needless to say I never touched them again.It made my face all itchy and dry... plus it took 5 days to clear up...worst experience ever! Hi Ren! Love your blog...been a longtime reader =] Anyhow, one of my worst experiences was with a Shiseido foaming cleanser from the Beneficence line. My mother was trying to replicate a facial she got a few days ago on me (essentially I was her guinea pig) and used the Shiseido cleanser because she thought it was gentle enough. Plus it was Shiseido, so it must be good right? Turns out I broke out in hives all over my face and neck. I had to take Benadryl to calm it down. Good thing it was winter break! this sounds like a really good cleanser...can u please do a review on the product? My worst experience was when I was stuck out of town for 3 days with no store near by (camping) and had to wash my face with bar soap and water...talk about peeling skin and dryness galore!! never again!!! my worst experience was probably when i used proactive and it made my skin look brownish and splotchy. not sure if it was due t drying out my skin. i stopped using it the next day right away! i ended up trying to cover it with make up for picture day.. but that made it look worse lol. Do you ever get a little too excited to try a new product? Well, that was my reaction about two summers ago when I was in Vietnam. My aunt from France was visiting Vietnam around the same time and brought me some face wash she got from good ole’ France. Ooh laa la? NO! At first, I was really excited because come on, who doesn’t like getting international beauty products. I washed my face before I went to bed and my face felt very stiff as if I just gave myself a facial with egg whites. Trust me; I’ve done it before so I know the feeling. Thankfully, I moisturized my face before I went to sleep. In the morning, I woke up and my pillow and white crusty pieces on it. Eww…did I drool? That would be so embarrassing. I hurried over to the mirror and checked out if I had streaks of drool. *Gasp*…it was much worse. The crusty white stuff was all over my face. For some odd reason, the French face wash that I could not pronounce the name of dried my skin and the white crust was my dry flaking skin. That was strange because I even moisturized the night before. I was supposed to go out but I refused to step out of the house with flaky skin. That morning and afternoon, I spent my day in my room tweezing off my bits of dry skin. It was not fun! And you bet…I NEVER used that facial cleanser again. For some odd reason, my cousin tried the same cleanser and she received great results. Me?...I still scorn that wash that I don’t remember the name to. hi, my experience was with my moms avon renew cleanser, i was visiting from school and used her face wash, I had some sort of allergic reaction because my face was itchy and bumpy for at least three days. I had to use a fask mask to help clear it up. My worst experience was a Mary Kay cleanser that I felt pressured to buy way back when at one of those "parties". OMG, I had little white bumps ALL over my face and it took forever to clear up! This was a while ago, so now anytime anyone tries to get me to go to a Mary Kay party, I run in the other direction!!! I would have to say my worst experience was with Clean and Clear Morning burst. After i washed my face with that, it would be so dry and itchy and my face would feel like its so tight. I don't really like that kind of feeling. havent had too many bad experiences with facial cleanser. OMG Ren... my worst experience EVER was from Noxema. My face looked raw (red and raised skin) for 3 weeks. I ended up in the ER. This happened when I was 16 yrs old. My family had no health coverage & we weren't on public aid since my granny refused to go after mom for child support. LOL!! That was the condition for AFDS and Medicaid... you had to allow the state (Georgia) to go after the biological parents... anywho back on topic ;-) Now the color MAC foundation I wear is NC45 so can you imagine how horrible I looked? I could not miss school so I was mocked and ridiculed and teased on a daily basis... rumors started I had some sort of disease... what disease no one knew... but they just knew I had something! LOL!! My BFF will still to this very day laugh @ me about it. I can laugh now but gosh was I sad for a long time. Guess what? I have another story! Not from skincare though... my aunt used to arch eyebrows really well.... well she used Nair to do it... I ended up with red raw looking skin again! This time only on my forehead! LMAO!! AND no eyebrows for about 3 months! Luckily I was 23 & married by then. HAHA! my worst experience has to be the past 15 months,ever since i had my son 15 months ago my skin hasn't been the same i break out a lot,my pores are so big i feel like you can see them from a mile away and i have really bad ance scaring. I have reddness on my cheeks and it seems like theres notthing i can do about it. I feel like i have tired everything out there and everyone keeps saying try this and that but everything is a lot of money and i'm on a budget.I would love to try this product out and hope that you pick me. Hey RenRen, I know we're supposed to put down our worst experience with skin care products, but what if I've never used a skincare product before? I've just always scrubbed my face with a bar of soap and TA-Dah!! But yes, I think its because I dont know what would be good for my skin. ALot of people comment me on how nice my skin is, but I dont see why, because theres nothing special to it. I'd love some input on how to find the good type of skin care products. Thanks a bunch RenRen! I've pretty much have had horrible experiences with ALL of the facial cleansers I've tried these few years. But the one cleanser that stands out as the worst of the worst has got to be the liquid clinique face wash which is part of the 3 step system they advertise. I had went to a clinique counter in desperate need of a face wash that would actually work and not irritate the crap out of my skin. I've always heard pretty good things about clinique and there skincare products and thought that I should give them a try. Well the SA there explained to me how each product worked and while doing so she would apply each product of the 3 step system to my face. I had makeup on already and she puts the liquid face wash on my face without any water at all and just let it sit there on my skin and she only wiped it off with a tissue. Then proceeded to go onto the toner and lotion. The next day I woke up with these tiny little pus filled spots ALL OVER MY FACE! It was worst on my chin area for some reason. Not only were they painful but they were itchy too and my skin felt so dry, patchy, and flaky too. I had to slather my skin with hydrocortisone cream for about 2 days. It was bad enough my mother let me stay home from school those 2 days. My worse experience with a cleanser was actually when I was vacationing in Vietnam. I had forgotten my neutrogena cleanser, so I sent my grandmother off to get one. Well, I didn't realize that sometimes the products in diff. countries are way passed expiration date. Yes, I am so serious Ren Ren. My face burned, flaked, and I had dry patches all over my face. To make matters worse, the water there is diff. too, so that made my face worse. I had to have my mom send my neutrogena from America (took about a week) and for the rest of my vacation I only washed my face with bottled water! I used a glycolic acid cleanser by Peter Thomas Roth, but it really irritated and dried out my skin. Do you happen to know if 3% is too strong? I'm relatively new to the makeup scene and I thought I play it safe [and not make my wallet cry] by trying some "reliable" drugstore brands: Physician's Formula [Organic line] and Aveeno. After checking out my local Rite Aid and various online reviews, PF's Organic mineral line seemed like a good start [especially with a 40% off discount!]. After one use, my face did not respond in kind and was covered with dry, red scaly blotches! Allergic reaction to organic makeup?!? Didn't think it could be so!